Beclabuvir is an allosteric inhibitor that binds to thumb site 1 of the hepatitis C virus (HCV) NS5B RNA-dependent RNA polymerase, and inhibits recombinant NS5B proteins from HCV genotypes 1, 3, 4, and 5 with IC50 of < 28 nM. MK-4882 is a potent HCV NS5A inhibitor. 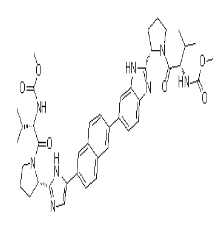 Elbasvir (MK-8742) is a hepatitis C virus nonstructural protein 5A (HCV NS5A) inhibitor with EC50s of 4, 3 and 3 nM against genotype 1a, 1b, and 2a, respectively. Faldaprevir, also known as BI-201335, is a potent NS3/NS4A protease inhibitor potentially for the treatment of HCV infection. MK-5172 is a selective inhibitor of Hepatitis C virus NS3/4a protease with broad activity across genotypes and resistant variants, with Ki of 0.01 nM (gt1b), 0.01 nM (gt1a), 0.08 nM (gt2a), 0.15 nM (gt2b), 0.90 nM (gt3a), respectively. Ombitasvir is a potent inhibitor of the hepatitis C virus protein NS5A, with EC50s of 0.82 to 19.3 pM against HCV genotypes 1 to 5 and 366 pM against genotype 6a. 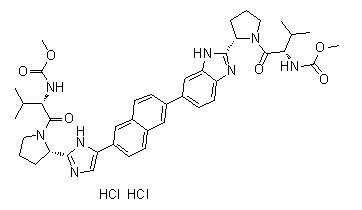 Ravidasvir, also known as PPI-668 and ASC16, is a second-generation, orally active, potent and selective HCV NS5A protein inhibitor. Ravidasvir (PPI-668) is an investigational NS5A inhibitor in clinical trials for chronic hepatitis C genotype 4. Ledipasvir acetone is a hepatitis C virus (HCV) NS5A inhibitor.